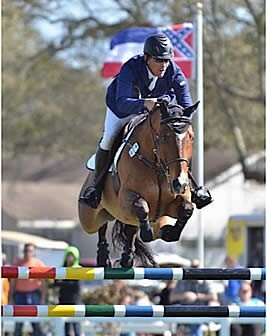 Matt Cyphert of Northlake, Texas and his own Lochinvar won today’s $35,000 CWD Grand Prix, besting a field of sixteen horse and rider teams on the world renowned grass grand prix field at the Gulf Coast Winter Classic. Only four advanced to the jump off round. “Clearly the course was pretty appropriate with sixteen starters and four clear. It was a nice track and he [Rheinheimer] used the whole field, which was fun for us and for the spectators,” commented Cyphert. “The height was pleasant, but there were a lot of technical questions on the field. While there were a lot rails around the course, the meat of it was the triple combination. The entire combination had to be quiet and that was the hardest part of the course,” he said. “It rode rather tight and you needed to have a careful horse and my horse is very careful,” he said. Chanel Du Calvaire, owned and ridden by Francois Lamontagne of Saint- Eustache, Quebec, Canada, was the second to go in the class and the first to turn in a clear first round in a time of 81.817 seconds, well within the time allowed of 88 seconds. Six trips later, Cyphert and Lochinvar insured there would be a jump off when they turned in a clear first round in a time of 76.327 seconds. Fellow Texan, Jordan Gilchrist of Flower Mound, Texas, and her own Happy Boy Van De Doornakkers joined in the jump off after posting a clear first round in a time of 84.826 seconds. Shannon Hicks of Lake St. Louis, Missouri, in the irons of Helen Gilbert’s Carit DMZ, were the last to go and turned in a clear round in a time of 81.665 seconds and joined the trio for the jump off. Course Designer Allen Rheinheimer set the jump off course with a time allowed of 45 seconds. Lamontagne and Chanel Du Calvaire were the first to go and pulled a rail at the combination, finishing with four faults in a time of 37.127 seconds. “Francois went in and left a stride out. My eyes got big watching him thinking if he stayed clear, we were all going to have to go all out. When he dropped a rail in the combination, I decided I would just ride it quick enough and careful,” said Cyphert. Cyphert did just that, posting a clear jump off round in a time of 39.432 seconds. 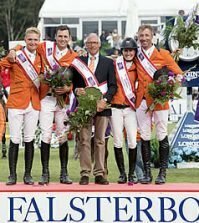 Gilchrist and Happy Boy Van De Doornakkers were next, but with a rail in the combination, the four faults in a time of 41.547 seconds would see them sitting in third place. Hicks and Carit DMZ had the enviable last to go position but finished with twelve jump faults in a time of 43.483 seconds, putting them in fourth place overall. “It’s so tough when there is a smaller number in the jump off and if you’re going early you just have to decide how you’re going to play it. It’s a chess match for all of us,” commented Cyphert. “I decided to be quick enough and careful. It worked out for us and I’m really happy for both me and my horse,” he said. Fifth place went to the fastest of the four faulters, Holly Shepherd of Grand Bay, Alabama and Loretta Paterson’s Triompf. The pair turned in a four fault first round in a time of 77.655 seconds. Leann Kelly of Valatie, New York and Honorway Farm, LLC’s Leander were awarded sixth place after posting a four fault first round in a time of 78.047 seconds. Seventh went to Brooke Kemper of Culpeper, Virginia and her own Classified after posting a four fault first round in a time of 78.167 seconds. Hicks returned for eighth place, this time in the irons of Helen Gilbert’s Emir D after posting a four fault first round in a time of 79.504 seconds. Amanda Forte of Glenmoore, Pennsylvania earned ninth place with Cerulean Stables’ HHS Louis for their four fault first round in a time of 82.099 seconds. Hannah Donald of Highland Village, Texas and her own Commissario 6 finished in tenth place with a first round time of 83.870 seconds and four faults. 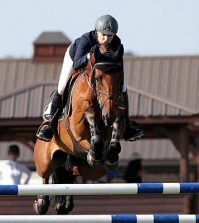 Eleventh place went to Fleur De Lis Farms’ Ziezo, ridden by Scott Lenkart of Bartonville, Texas, and Hailey Henderson of Lafayette, Louisiana and her own Zine Dine wrapped up the class with twelfth place. “I’ve had Lochinvar since he was five and have brought him up through the ranks. He’s twelve now and he won five grand prix last year. He got some good prizes before that, but last year was the first time he started winning. He has really settled in and matured,” commented Cyphert. “It’s nice to start off this year early with a win,” he added. “I am proud to be a sponsored CWD rider, so it was really great to be able to win their Grand Prix today,” said Cyphert. “It is so much fun showing here in Gulfport,” he continued. “It is such a comfortable, fun environment and we’re all so supportive of each other,” he added. “Bob and his staff do so much for all of us here and his shows are just run beautifully,” said Cyphert. 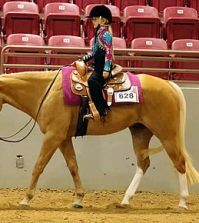 “This is the best horse show in the country, and that’s God’s honest truth,” Cyphert said. “The crowd here was great today,” he continued, “I think a lot of people know my horse. They have seen him grow up and I had people come here last week who sought me out to see him. He is such a special horse that it makes me really happy to see people get excited for him and cheer him on,” he added. Micro-chipping is now a requirement! 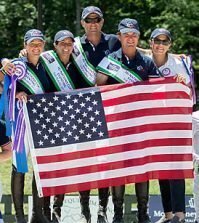 The United States Equestrian Federation (USEF) now requires horses to be micro-chipped by December 1, 2017 in order to be eligible for Horse of the Year awards. Pricing for this can range into the hundreds of dollars at the other winter circuits. Not at the Gulf Coast Winter Classic! For only $28, all those showing in Gulfport can have their horse micro-chipped by Dr. Patrick Cleveland, the Official Veterinarian of the Gulf Coast Winter Classic. Dr. Cleveland is available to discuss any questions you have about micro-chipping and Mary Babick, United States Hunter Jumper Association (USHJA) Hunter Vice President, is also available for questions about the rule change.